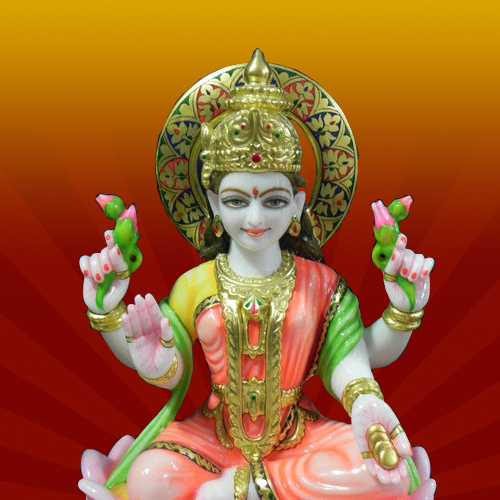 We manufacture statues of Goddess Lakshmi in different forms- her sitting on her lotus or standing. The marble used is white marble keeping in line with her complexion. The detailing of the eyes and jewellery can be using marble or using colourful stones. 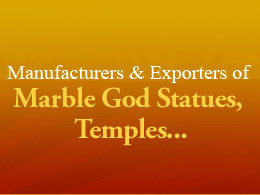 We use marble procured from Rajasthan to make the statues. They are of different shapes and sizes and are the ideal objects to adorn your temple at home or puja room. They are easy to clean and because they are made using high quality marble, they wont change colour even after years of manufacturing. The statues can be made in accordance with the customers specification. The designs used are the traditional designs used to make idols of Goddess Lakshmi. Our customers were highly satisfied after buying the idols from us. 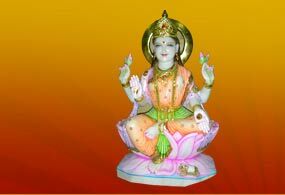 The Laxmi Statue that we offer is of Goddess Laxmi, sitting on her lotus, cross legged with a benign smile on her face. This is the posture that Goddess Laxmi has been crafted in for centuries and this is the traditional design. The idol is made using white marble and the tiara, eyes and apparel has been made using colourful, well cut stones. It is made using good quality marble procured from Rajasthan, which will not change colour even after prolonged exposure. It is easy to clean and it is available in different sizes. 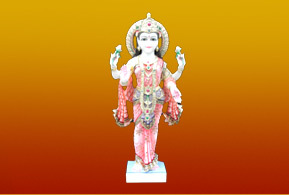 The idol is available in different sizes to suit the space of your temple at home or puja room. It is pristine to look at and attracts the attention of the person looking at it immediately. 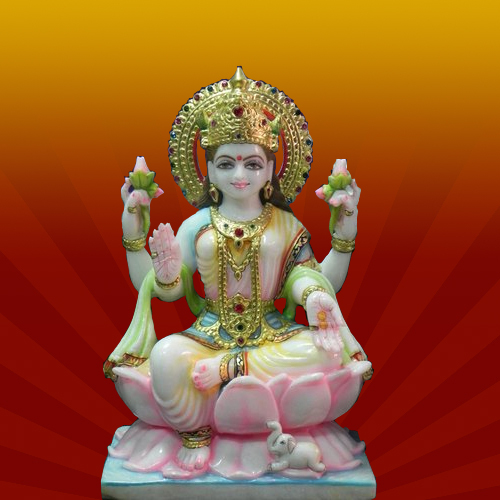 The marble Laxmi statue that we offer is a colourful one, where the saree and ornaments of Goddess Laxmi, including the lotus that she is sitting on is done using stones. It is made using white marble primarily and this marble has been procured from Rajasthan, from the best vendors possible. 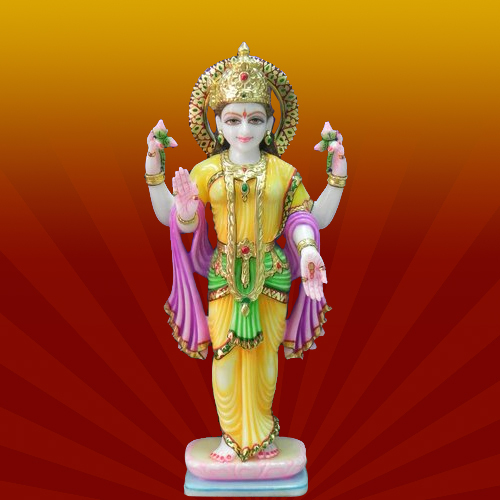 The idol is available in numerous sizes to fir the temple at your house or the puja room. We offer special idols where Goddess Laxmi is seated on a singhasan or throne. The design is very traditional and the idol has been polished and cut well, to add a glaze to it and there are no rough or jagged ends in the statues. Since they are made using good quality marble, they retain their colour even after prolonged exposure to the air. 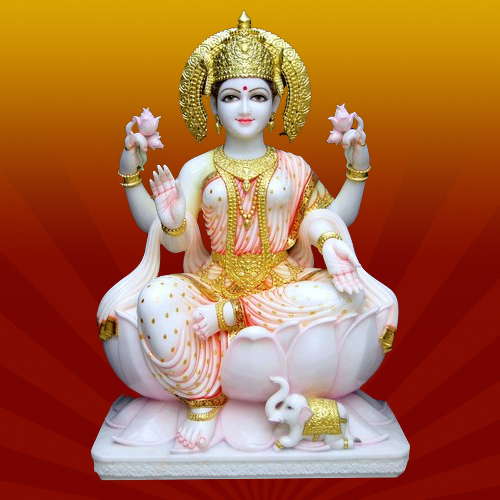 We offer idols of Goddess Lakshmi that are made using pure, white marble, procured from Rajasthan. The design is a traditional one, where Goddess Lakshmi is standing, with the lotus in her hand and a Halo behind her head. Only her eyes, lips and bindi have been done with coloured stones, the rest is done using white marble. The marble has been cut well and polished to add glaze and fineness to the idol. It is ideal as a gift or it can be kept at the puja room in the house. It is very attractive and will draw praises from whoever sees it. It is available in different sizes and designs, to suit the space you are going to keep it in. We offer the idols at a competitive price. We offer an exquisite statue of Goddess Laxmi, where white marble, along with colourful stones has been used to make the idol. The ornaments of Laxmi ma have been done using golden stones, including her halo; her saree is done with light shades of pink, to match the lotus she is sitting on. The posture of the idol is a traditional one and it is ideally kept in the puja room of the house, although other rooms too are suitable for it. We make the idols using marbles from Rajasthan and they have been cut well and polished to add glaze and finesse to the idol. Because it is made using good quality marble, it doesnt change colour even on prolonged exposure to the air. 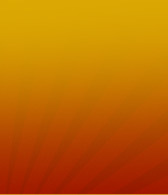 It is available in different specifications according to client requests.